Mary's career as a marketing and communication professional has been in companies undergoing significant evolution, change and growth. She has held leadership positions with responsibility for developing strategic marketing and communication plans to support long term growth and business sustainability goals. Innovation, development and strategic alliances were key strategies for success. In addition, she has more than 30 years experience and expertise in designing and delivering educational/developmental programs for companies and organizations. Earlier in her career, Mary held management positions at The First Wisconsin National Bank - Milwaukee, Federal Reserve Bank of Chicago, NiSource, Northern Trust, Center for Management Development and Whiteco Advertising Agency. In addition to HeimannHills, Mary serves as Adjunct Faculty in the MS - Global Strategic Communication program at Loyola University Chicago. She teaches Organizational Leadership and Change Management, Communication Ethics and Law, Corporate Communication, Foundations in Strategic Communication and the Graduate Capstone. Mary also serves as an MBA Visiting Professor at Keller Graduate School of Management. She holds graduate teaching certifications in marketing management, advertising/IMC, consumer behavior, research, sales force management, channels of distribution, new product development and sustainability marketing. She is a certified blended learning strategist. Mary serves on the Advisory Board for Abraham Lincoln University and BeulahWorks, Inc.
Mary holds a BS in Business – Marketing/Finance from Marquette University and an MA in Organizational Communication from Purdue University. She is a six sigma green belt and an Accredited Business Communicator through the International Association of Business Communicators. Mary was named the 2012 IABC Chairman Award recipient, recognizing her work in advancing global standards in organizational communication. IABC Chicago awarded her the 2015 Karen Utterback Award. In 2016, she was named an IABC Fellow and is a Fellow of the Royal Society for the encouragement of Arts, Manufactures and Commerce. (FRSA). 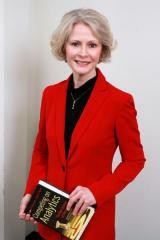 Mary speaks internationally and nationally on marketing, communication, standards and practices and leadership topics.